Champion Homes to Build "House United"
Champion was excited to be selected to build the House United and we are proud to donate this home to a deserving veteran. Along with our partners, Craftsman, a division of Sears Holdings, as well as NextGen Home, Bank of America and nonprofit organizations, Rebuilding Together and Heroes at Home we will construct two halves of a modular home in our manufacturing facility in Salisbury NC. One half will be displayed at the Republican National Convention in Tampa and the other half will be displayed at the Democratic National Convention in Charlotte. At each of the events Ty Pennington will lead delegates as they complete the construction of the home in a display of political unity in support of our troops. After the home is completed it will be placed on its foundation in Charlotte and then handed over to a deserving veteran. PHOENIX – July 27, 2016 – Of the 500 plus manufactured homes built each year at Champion Home Builders’ Chandler, Arizona, facility, there’s one that has special significance. 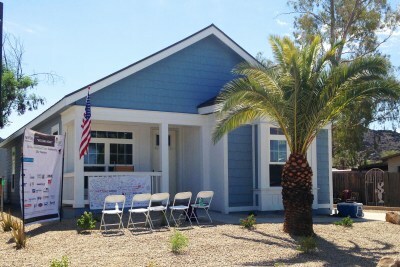 That’s because it is the new home of Zahid Ali, a Phoenix-area Marine Corps veteran. On July 26, Ali and his family were presented with keys to their new 1,680 sq. ft. residence as part of “Welcome Home,” the joint effort of Champion Home Builders, NextGen Home TV and Rebuilding Together. “Welcome Home” was created to help mark the 20th anniversary of Rebuilding Together's “Kickoff to Rebuild” project. From the porch of his new home, Ali shared with an audience of contributors and media the story of his life-changing tour in Afghanistan, and emphasized how grateful he and his wife are for their new home. The home features an expansive kitchen with solid surface countertops, an island, stainless steel appliances and modern planked ceramic floors. Also included: a luxury master suite, beautiful bathrooms, a pre-wired office, a custom exterior, and energy efficient features such as a tankless solarpowered water heater and durable metal shingle roof. The home is fully furnished, thanks to local and national donations. But those 2,000 applicants, as well as Ali, weren’t the only veterans affected by “Welcome Home.” Nearly a dozen of Champion’s 150 employees in Chandler are military veterans. Rick Boles, general manager of the Chandler plant, is himself a former Marine. He was heavily involved in the project and readily acknowledges the contributions of not only his fellow vets, but of every Champion associate whose efforts touched the Ali family’s new home. About Champion Home Builders, Inc. Founded in 1953, Champion Home Builders specializes in a wide variety of manufactured and modular homes, park model RVs and modular buildings for the multi-family, hospitality, senior and workforce housing sectors. Champion started as a single manufacturing facility in rural Michigan and grew to offer factory-built housing and other structures throughout the U.S., United Kingdom and western Canada. The company operates 28 manufacturing facilities in North America and Europe, and employs more than 4,200 people worldwide.